Deep fried, crispy strips of catfish, coated in a mixture of corn meal and flour, are a true deep south favorite. 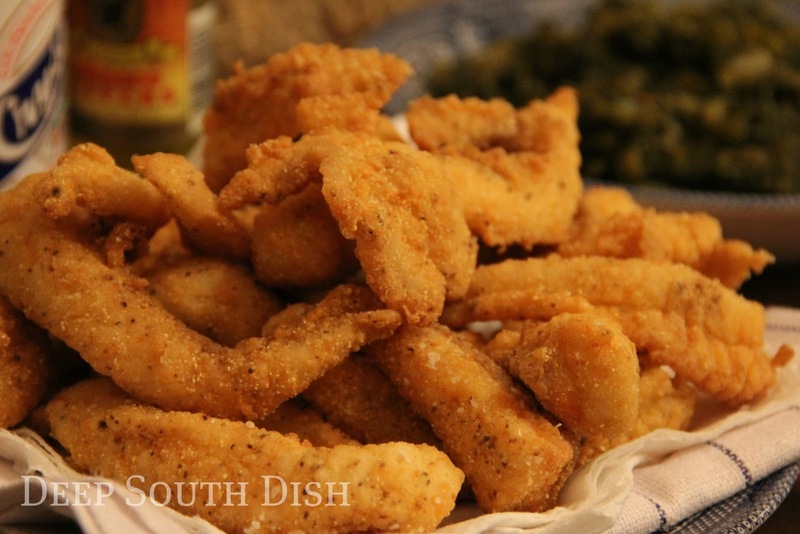 Fried catfish is a common dinner in the south, especially during Lent, but we southerners love it anytime, really. There are catfish houses everywhere down south, where catfish is often all you can eat, coleslaw, hush puppies, and homemade buttermilk biscuits with jelly or honey are served family style, and sweet tea comes most often in Mason jars or icy tin cups, alongside local favorites like fried dill pickles, turnip greens, fried okra, squash casserole, and fried green tomatoes. One of our favorite local spots for fried catfish on Friday is Pleasant's BBQ, a family owned place that's been around for years and where they serve some pretty rocking BBQ but the special on Friday is always fried catfish. I am convinced he uses some of his rub in the coating, so I've tried it and indeed, it rocks! Aunt Jenny's also in Ocean Springs, and also family owned, where not only is the food delicious but it comes served in the midst of some gorgeous and very old oak trees and a simply beautiful view across the bayou off of Biloxi Bay has excellent catfish. In Gulfport, Catfish Charlie's is also family owned, excellent and has been around forever. All delicious options! Did you know that 75% of the world's supply of farm-raised catfish comes from right here in my home state of Mississippi, making us first in total U.S. catfish production? Humphreys-Belzoni, Mississippi claims the title of Catfish Capital of the World, has 117 catfish farms and more than 35,000 acres of farm-raised catfish, making it more than any other single county in all of the United States. In fact, Humphreys-Belzoni, hosts a huge World Catfish Festival every April, drawing crowds upwards of 20,000 to the Delta. Now for me, my fried shrimp is coated in flour. Self-rising flour. Period. My fried oysters are coated only in corn meal. Yellow corn meal. Period. But my catfish is coated in a mixture of the two, mostly cornmeal, a little flour. That's the rules and the only way to eat any of the above three at least for me. This is not to say that my way is the right, or the only way. It's just my way! When I fry catfish like this, I also prefer to cook the catfish in smaller strips rather than cooking them as large whole fillets, like I would cook when I pan fry. What that involves is that if you had a whole catfish and you filleted that into two halves, I would split those halves into multiple strips, cutting along the natural "seams" of the filet. I love the way the smaller pieces curl up in the fryer - to me, that's fried catfish! The best way to cook fried catfish, in my opinion, is to deep fry them, whether that's in a large pot filled with oil on the stove, or a deep fryer. It cooks the catfish fast, and keeps them nice and crispy, the way that they are intended to be eaten. I've mentioned before, I do not do greasy, and that is why I love using a deep fryer. I upgraded my fryer to a TFal fryer which has an easy draining feature and a built-in oil storage that can be removed and refrigerated between frying. Since we don't use our fryer that often, I really love this feature! Check out more of my favorite fish recipes on Pinterest! Rinse the fillets. Cut into three to four strips lengthwise. Season fish on both sides with salt, peppers, Cajun seasoning and Old Bay, pressing lightly into fish. Preheat fryer to 375 degrees F and let the fillets rest while the fryer heats up. Whisk the flour and cornmeal together in a large bowl until well blended. Dip the catfish fillets in the mixture until well coated, shake off any excess and set aside. Once the oil is heated up, pass fillets through the cornmeal again, shake off and drop into the fryer with the basket lowered. Fry only a few at a time so as not to overcrowd and bring down the temperature of the oil. Fry until fish floats and is golden brown, about 4 to 6 minutes, depending on size. Drain on several layers of paper towels before transferring to a platter or individual plates. For hushpuppies, add enough buttermilk or milk to the dredging cornmeal to form a thick batter and drop by spoonfuls into the hot oil until browned and cooked through. 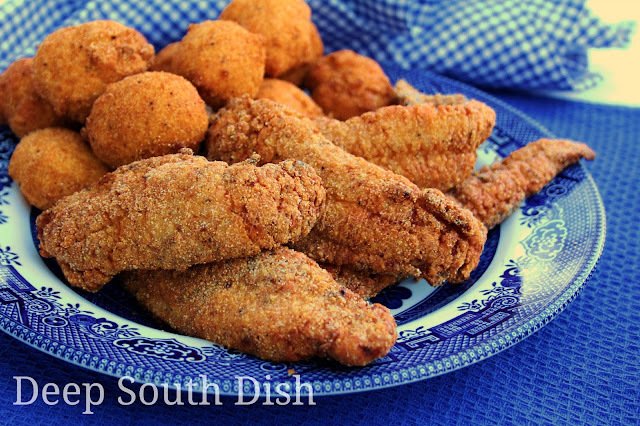 Serve with hushpuppies and tartar sauce, offering hot sauce at the table for sprinkling on the fillets. Great with cheese grits and homestyle tomato gravy, greens and coleslaw. Cook's Notes: I also use this dredge for other fish fillets such as white and speckled trout, mullet, tilapia, crappie and flounder. You may substitute cornmeal mix if you prefer, however it does already contain salt, leavening and flour, so omit the self rising flour and reduce the salt you would use with all purpose cornmeal. I recommend White Lily Buttermilk Cornmeal Mix. May also use a deep, heavy bottomed pot, or large iron skillet, and enough vegetable or canola oil to fully cover the fillets. Variation: Make a mixture of Creole mustard and yellow mustard, about 1/4 cup total. Beat an egg with just a splash of milk and stir into the mustard. Brush both sides of the catfish with the mustard before dredging in the flour/cornmeal mixture and frying. Buttermilk Brined Fried Catfish: Instead of rinsing fish, add 1-1/2 cups buttermilk to a bowl along with 2 tablespoons of hot sauce. Soak fish in buttermilk for 30 minutes, and before dredging, allow excess buttermilk to drip off of each fillet. Proceed as above. Oven Fried: Prepare as above and place fish, skin side down, on a foil lined pan drizzled with butter or cooking oil. Drizzle additional oil or use a cooking spray to generously coat fish on top. Bake in a preheated 400 degree F oven until golden brown, approximately 20 to 25 minutes, depending on the thickness of fillets. BBQ Joint Catfish: Add 2 tablespoons of your favorite rib rub to the cornmeal mix. Adjust or eliminate other seasonings as needed. Homemade Tartar Sauce: Combine 3/4 cup mayonnaise with 1/4 cup chopped pickle (dill or sweet), 2 teaspoons finely minced onion, 1/2 tablespoon lemon juice, 1/8 teaspoon garlic powder and a pinch salt and pepper to taste. Taste and adjust seasonings. Tip: Frozen catfish often has a muddy flavor to it. You may be able to counter that by purchasing only catfish from the U.S., removing any fat and/or "dark meat" that is present on the fillets and soaking them for 30 minutes at room temperature in a salt water or buttermilk brine. For 1 quart of water or buttermilk, use 1 tablespoon of salt. What can I say? Yummmmm. Catfish is just about my favorite food. I have done that before and you're right Nicole, it is good!! Thanks for the reminder!! I found some Slap Yo Mama seasoning in my area. Man oh man!!!!!! It's good!!!! I'm so glad Tammy! I really love it - well, you probably already knew that. It's got a nice blend of all the seasoning and a fairly subtle kick. I love using it much better than plain cayenne which can be a bit overpowering. So glad you found some!! Very very good recipe, and the instructions to cut into smaller pieces were a great tip! Thanks - I'm so glad y'all enjoyed it! Those little strips of tender goodness are called goujonettes. I absolutely LOVE catfish and, like you, want it prepared with a specific coating, and this one is perfect. Oh goodness, thank YOU so much for saying that. I've really put my heart and soul into this blogging project so that means a lot to me. Thank you! You mentioned some mighty fine catfish places Mary, but the best by far in my experience has got to be Stogner's Fish Camp in Tylertown, Mississippi. Worth the drive no matter where you're driving from! Thanks for sharing that Jan! Thanks for sharing Mary. I've lived in Mississippi my whole life and I've learned a thing or two from you. Do you have a cookbook published? You could replace my old BettyCrocker!! Thank you Rachel! I'm certainly no expert, but I've sure enjoyed sharing my cooking trials! I did publish a cookbook recently. You can find it at bookstores and online at Amazon here. I hope you enjoy it!! It depends on what is in the rib rub you use. I still season the fish but go lighter when adding my rub in the dredge. Sounds delicious to me! Just remember depending on what is in the rub you use, you may want to go a little lighter with the seasonings. Some folks like having the nuggets since they're kinda bite sized. It's just a fillet that's been cut into chunks really. Oh, and I plan on using stone ground cornmeal. It's all I have on hand. Thank you so much for taking the time to reply. Bless you. This turned our very well for me. I did the buttermilk brining and that worked out great. I had catfish before from a black family in Houston that said they used a mixture of cornmeal and sweet cornbread mix for the coating, and it was by far the best catfish I have EVER eaten. Mind you, I had a full blooded Cajun grandmother that was a premo cook too. I just wish I had the recipe for it...I can't find a recipe like it online though. Try mixing Jiffy cornbread mix with regular cornmeal. Jiffy has more flour than cornmeal, baking powder, salt and sugar in it, which makes for a sweet cornbread result.